NEW DELHI: Terming organ donation “an egalitarian and a moral act”, Health Minister J P Nadda said the government will come out with rules, regulations and protocols for facilitating organ donation as he pitched for making it a national movement and pledge his own. Expressing concern over the present rate of organ donation and transplantation not being close to the requirement in the country, he said organs were national resource and not even one should be wasted. “Donating organs is a gift and is an altruistic, egalitarian and a moral act. We can turn the ‘end of a life’ into a new beginning with donating our organs. “Let organ donation become a national movement and show to the world that even in death we care for our fellow citizens and humanity at large. 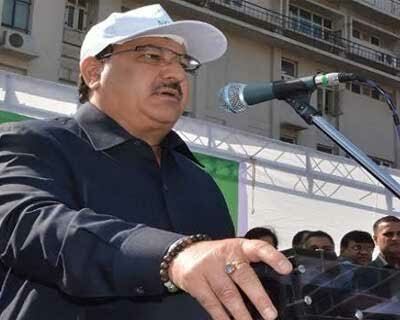 Organ is a national resource and not even one should be wasted,” Nadda said. He along with officers, staffers, doctors, nurses and other paramedical staff members of all central government hospitals of the national capital pledged to donate his organs. Also present were participants from the Walkathon that took place at the India Gate today to create and enhance awareness surrounding organ donation, an official statement said. “The Ministry is presently framing rules, regulations and protocols for facilitating organ donation. There are about 1.5 lakh brain deaths happening in the country every year, and organs from them can be used for saving lives of several lakh patients. “It is a matter of concern that the current organ donation and transplantation rate is not close to the requirement within the country for organs. We have started taking decisive steps for harvesting cadaver organs and tissues and saving many lives a result of this,” Nadda said. Health Ministry is implementing the National Organ Transplant Programme with a view to promote organ donation from deceased persons and increase the availability of organs for transplantation. The Minister said a number of activities have already commenced a part of the programme and the state governments have been sensitised about the need to have systems in place to improve awareness in this regard.